This book, guys. Where do I even start with this book? If there was ever a book that changed the way I viewed the world and sculpted my path in life, this would be it. My dear grandma had been telling me all about this book for a good few months before she gave me a copy for Christmas when I was 15, and I absolutely devoured it. For a couple of years now, my Grandma has been begging me to write a review and I've finally done it, although I'm uncertain whether she'll ever read it, unfortunately. To be honest, I put it off because this book means so, so much to me and I was worried I'd either get comments along the lines of "I hated this stupid book", or someone would read it based on my recommendation and hate it. It's so very personal to me that it seems a great risk to through my views out there. I truly believe it is one of the greatest books ever written, and it's a huge shame that it is so grossly overlooked. A Tree Grows in Brooklyn was the first book I ever read that didn't have a plot. I don't know if there's a genre for that, but it's my favourite for both books and films. For me, nothing is more engaging than a deep, thorough look at characters. A book that forces me to confront humanity and society enraptures me more than any action-packed plot ever could. In this case, we follow Francie as she grows up in a poor Brooklyn neighbourhood. She is 11 when we first meet her in 1910 and, as she blooms into a young woman of almost 17 at the end of the novel, she leads us through an exploration of human tenacity and dedication in the hardest of circumstances- poverty, bereavement, war- as well as all the problems teenage girls still face today, from identity to heartbreak. Every character is perfection, down to their imperfections. Francie's father Johnny is an alcoholic, but a truly wonderful, caring, loving man. Her mother's steeliness is the perfect balance of Johnny's expressionism, whereas Aunt Sissy's promiscuity is a symbol of her willingness to love and nurture everyone she comes into contact with. It all seems too perfect, but then we are watching the scenes through Francie's eyes, and she is determined to see the best in everyone. As a character, Francie is a wondrous feat. She has all the steely determination of her mother, yet with her father's romanticism, and her own love of education and, in particular, reading. The Nolans are a poor family but Francie has ambitions far beyond her status and works her hardest to rise out of the cycle of poverty she lives in. Smith's writing is so emotive and poignant that it never fails to make me cry (read more about that here). She has a real gift for making everything seem ok. Things aren't ok. Things go horrendously, hearbreakingly wrong but there is that thread of hope running through the whole story. Essentially that's what A Tree Grows in Brooklyn is- a tale of hope. Hope and love, and how we can achieve anything if we keep those two things close. At the same time, there is an inevitability about it- The ending so perfectly mirrors the beginning. Things change. Things get better. And yet nothing really changes. It's a testament to this that the book, written 70 years ago and set over 100 years ago, is as relevant now as it was then. As an adult, I can see how much this book really did shape my life. I read it repeatedly as a teenager and latched onto Francie. This was a young girl from a poor family who loved to read and was determined to live a full life. I could relate to her on a huge scale. Now, re-reading the book, I see that my tenacity at university was inspired by Francie. My eagerness to see the best in everyone is a reflection of Sissy. My childlike spontaneity is found in Johnny. At the time I didn't realise how instrumental it would be to read this book so many times at such a transitional time of my life. It really has shaped me, no doubt influenced by the weight my beloved grandma put on it. Obviously I'm going to give this book a ten out of ten. It's just a wonderful, beautiful yet heartbreaking coming-of-age story about the strength of humanity and I cannot sing its praises enough. If character-based narratives on humanity are your thing, like they are mine, I recommend Stoner. 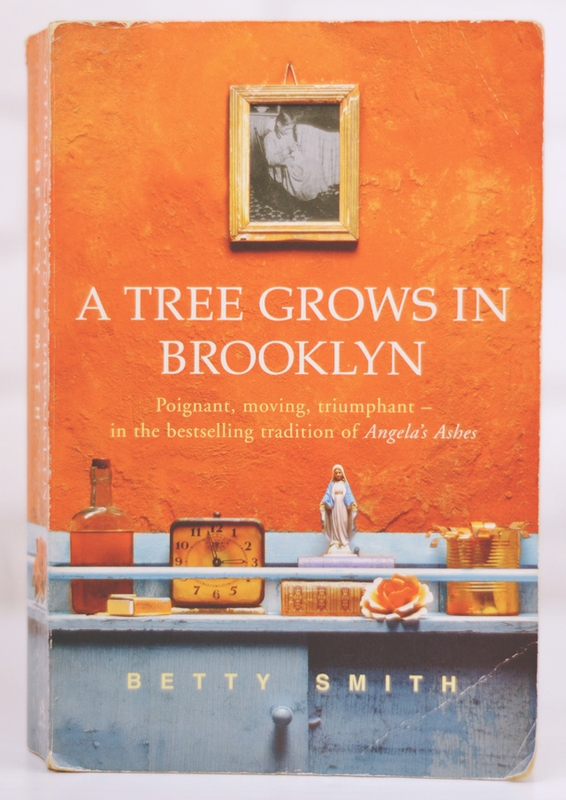 Although not quite as beautiful as A Tree Grows in Brooklyn, it has many similarities and is a wonderful book nonetheless. Buy A Tree Grows In Brooklyn here. By the way, Grandma, if you do happen to be reading this: Thank you for the greatest gift I was ever given. Wow, I don't know whether I'm just emotional today but your description truly made me tear up. The love you have for this book is so apparant and for your Grandma. It sounds truly beautiful and I also love books where you can fall head over heels for the characters. Looks like a great read, grandparents are always right! I love it when family recommendations turn out to be the best things ever. It always feels so special to connect a book to someone you love, I think. I've heard quite a lot about this book because everyone was talking about it on booktube in 2013/2014. I haven't read it yet but maybe I'll pick it up from the library or something (as I'm on a book buying ban).